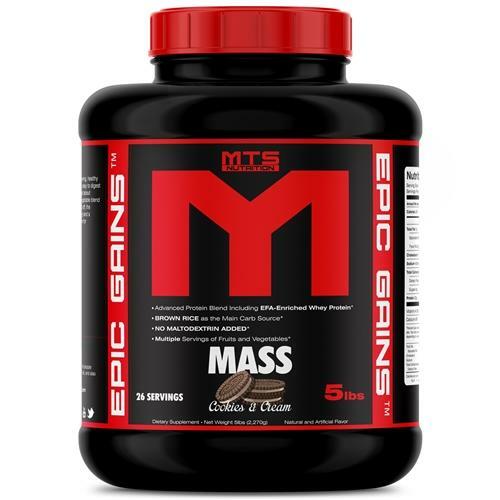 MTS Nutrition Epic Gains is the FIRST EVER LEAN MASS GAINER to address everything a growing, healthy fitness enthusiast needs. For decades elite level athletes have relied on BROWN RICE; a hypoallergenic, easy to digest whole-food carb source. We didn’t stop there. Athletes trying to gain lean mass often forget about vegetable, compromising overall health. This is why MTS Nutrition added an advanced vegetable blend high in antioxidants and equal to several daily servings of fruits and vegetables! To top it all off, the protein quality in Epic Gains includes Milk Protein (comprised of 80% Casein and 20% Whey) and a special Whey Protein high in essential fatty acids.